It started with a spontanius jam session at one of the European folk music festivals. And then it continued.... Tree musicians from Sweden and Germany met more and more frequent and a new band was born: Trio Larsson Mayr. Our first CD was created in a mountain village in Germany a beautiful summer week in early june this year. 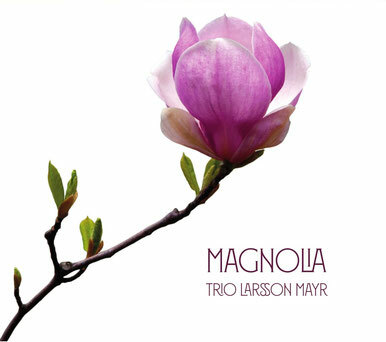 We hereby present our first CD – a collection of 15 very different flowers of different colors, packaged in a bouquet for you to enjoy: Magnolia! The Magnolia is an ancient plant, with a history nearly 95 million years old. Still, its fragant flowers are very much loved today, just like the traditional music that we love to play. With playfulness and a lot of joy, we mix our own compositions with traditional pieces on instruments like violin, accordion, nyckelharpa and guitar, and last but not least Anders' deeply touching vocals. Mit unbändiger Spielfreude mischen sich eigene Kompositionen mit traditionellen Stücken. Mit Geige, Akkordeon, Nyckelharpa und Gitarre und nicht zuletzt Anders‘ tief berührendem Gesang kreieren die drei Vollblutmusiker ein Klangbild, das mal „nordisch-melancholisch“, im nächsten Moment impulsiv und energiegeladen erscheint. Trio Larsson/Mayr är ett alldeles nytt folkmusikband på den svenska folkmusikhimlen. Efter att deras vägar korsats på Europas folkmusikfestivaler under flera år har nu samarbetet fördjupats ytterligare. Gruppen består av tre rutinerade musiker som alla turnerat runt i världen med sin musik sedan 1990 talet. Med en sprudlande spelglädje möts de tre musikerna nu i en helt ny konstellation. Egna kompositioner blandas med traditionella låtar och med sina instrument fiol, ackordeon, nyckelharpa, gitarr och sång skapar de musik med mycket kraft och energi. NEW CD! - NEW CD! - NEW CD! - NEW CD!